Le Perchoir is the top floor apartment. 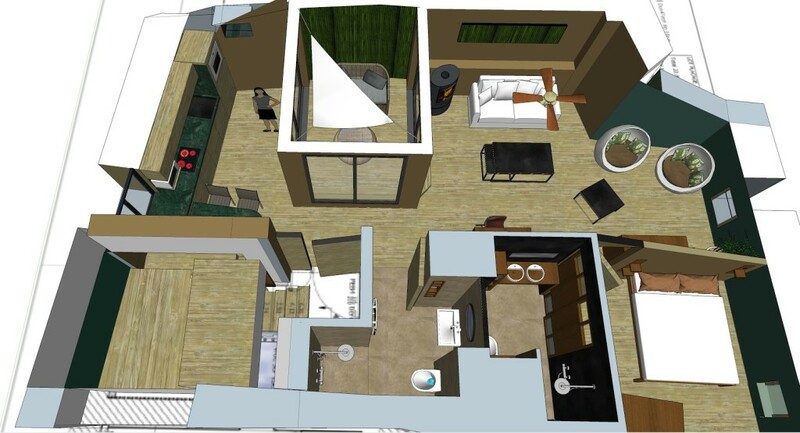 There are two bedrooms and two bathrooms with a large open plan living area. There is also an additional sleeping area suitable for children/young adults. It has an adaptable format and either one double or two single beds can be created. All the living areas and the main bedroom have air conditioning. The living area is open plan with a kitchen, dining area, a terrace, and a sitting room/tv area. The terrace comes complete with a hammock which can be unslung for a nap or a night under the stars. The spacious and uncluttered kitchen is fully equipped. The area shown on the plan below with the egg shaped seats is now the second bedroom.